A very good morning again and welcome to our IPDM-PAM “Interior Design Exhibition (id-x) 2010. First of all, We would like to express our sincere thanks to our Guest of Honour Yang Berhormat Datuk Edward Yong, Assistant Minister of Local Government and Housing, who has graciously accepted our invitation to this id-x exhibition today. We are indeed honored to have your presence here today Datuk. Our sincere thanks to Ar. Ronald Tang, our Organizing Chairman for today exhibition and his hard working committee members. And also thank you to Yang Berusaha En. Mohd. Suhaimi, President of IPDM for coming all the way from Kuala Lumpur to support our local IPDM-PAM (id-x) exhibition today. Thank you to all our supporters and exhibitors of IPDM and PAM Sabah and not forgetting our kind sponsors and the media too. Gone are the days when house buyers, corporate offices and retail shops owners are happy with just four walls and a roof over their head. As Malaysia had progressed over the years, its Citizen are now more educated and well informed on what is available to them in the context of comfort in their built environment. Today, the younger generations are more demanding for better quality design than their parents or Grandparents and it is timely for us Architects and Interior Designers as well as the specialist contractors to provide our enhanced services to meet this demands. Everyone today is talking about climate change and going Green. Yes, we all have a role to play in our daily lives to help reduce wastage of energy. Interior Design is all about visual and physical comfort, especially inside our built environment eg. A home or office. We all forgot and we took “Thermal” comfort for granted, we look a visual and physical comfort as a priority as Thermal comfort can be easily provided for by air-conditioning eg. Providing cold air in our hot environment and heating in other cold countries. Going Green vide Interior Design can easily be achieved without much additional cost when both Architects and Interior Designer starts on a correct footing. Correct orientation of windows and walls, with proper shading and ventilations can greatly reduce heat gain vide solar radiations in our hot humid environment. A typical roof system of a Malaysian Terrace House receives most of its solar heat gain from its roof. This typical roof gain about 50% to 85% of the total solar radiation heat into this house. Reducing solar heat gain through the roof with proper insulations should therefore be the main priority for keeping a house cooler for ‘Thermal Comfort’. Temperature difference of up to 4 degree Celsius had been achieved between roofs with insulations to those without insulation (Rockwool insulation). From this, one can see, a roof with proper ventilation and insulation will consume not only lesser electricity but will also be naturally cooler (up to 4 degree Celsius). However, I would like to bring to the kind attention of our Honorable Asst. 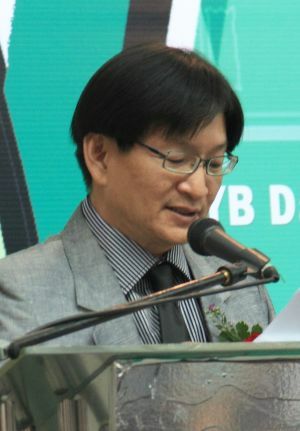 Minister Datuk Edward Yong and his Ministry, that unfortunately, insulations is a hidden item inside roof space and not all developers are prepare to provide for this due to additional cost of insulation when it cannot be seen by potential house purchasers. So, on behalf of all future house buyers in Sabah, I would like to appeal to the Honorable Minister to kindly study and consider on how to make it a requirement for all future housing development, to be provided with a minimal 50mm thick insulation wool with double sided aluminum sisalation sheet to its roof space. Knowing our Honorable Datuk and his Ministry, who has a long impeccable history of service to the building industries, who I am sure genuinely feels for the common man in the streets, would consider this reasonable appeal for the common good of everyone in Sabah. You will forever be remembered, for being brave enough to consider for the benefit of the future generation. For that, I thank you once again Datuk for taking time off from your busy schedules to be with us today for our id-x 2010 exhibition.